Rockit – the company behind the multi-award-winning portable baby rocker – has been crowned ‘International Business of the Year’ at the FSB Celebrating Small Business Awards. The South West finals of the national contest took place on Thursday 7 February and were designed to find the best small businesses from the region. Bristol-based Rockit – which launched in September 2017 – fought off stiff competition from other successful export businesses. Rockit has also been selected by the Department for International Trade as ‘Export Champions’ and will be engaging with other companies, acting as an ambassador and guide through their export journeys. (l – r) Seen here with compere Tania Edwards are Matt Sparrow, Matt Dyson and Nick Webb, collecting the PPS award from Cheeky Rascals’ director Selina Russell. 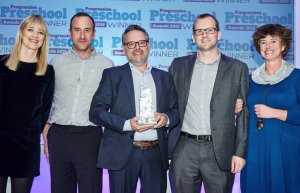 It’s not the first industry accolade for Rockit, which also won the hotly-contested Innovation Award at last year’s biggest ever Progressive Preschool Awards 2019.